The driver will pick you up at your cruise ship with your private modern, air-conditioned vehicle at a time chosen by you (we recommend 30 minutes after the ship docks) and bring you to Berlin. In Berlin you will be joined by one of our professional local guides who will then take you on a tour of the city, with an option to stop for lunch as well as free time. At the end of the day, you will be brought back to your ship. In Berlin the tour starts at the Charlottenburg Palace located in the western district of Charlottenburg. After meeting the guide here the tour continues through the western half of the city driving down the beautiful Kurfürstendamm stopping for a photo opportunity at the destroyed by Allied bombers Kaiser William Memorial Church. The tour then continues through the Central Park of Berlin, the Tiergarten passing the towering Victory Column and jumping out of the bus again at the German Parliament, the Reichstag. From here you will get a chance to stretch your legs as you walk the few hundred meters through the Brandenburg Gate into Paris Square. After Paris Square you will walk through the Memorial to the Murdered Jews of Europe and then to the site of Hitler’s Bunker before getting back on your vehicle. Once back on the vehicle the next stop is the architecturally astounding Potsdamer Platz and then onto the former site of the SS and Gestapo Headquarters which is now a museum called the Topography of Terror. This is coincidentally also the first time you will see a stretch of the Berlin Wall in its original placing so you will once again get a chance to get off the vehicle and take some photos. The infamous Checkpoint Charlie is the next stop on the tour and after that a lunch break can be taken if so desired. 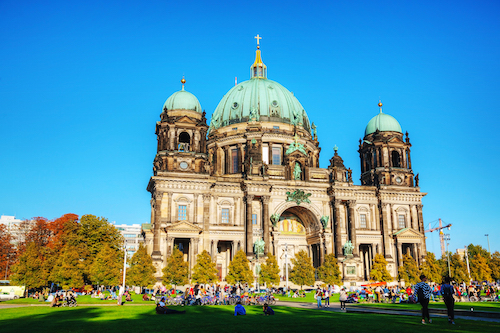 After lunch the tour heads up to the historic heart of Berlin passing the beautiful Gendarmenmarkt Square and the Book Burning Square before landing on the UNESCO World Heritage Site Museum Island that houses Berlin's five most famous museums. Depending on how much time is left the tour can continue on to the East Side Gallery and/or the former Jewish Quarter of the town which has now become the art district of Berlin. Upon request there will also be some free time at the biggest department store in Europe - KaDeWe. After the sightseeing lunch and free time, your private driver will bring you back to your ship! TOUR DEPARTURE TIME IS 30 MINUTES AFTER YOUR SHIP ARRIVAL. Please select departure time accordingly. Other languages come at an additional price of 100EUR (flat fee regardless of vehicle size). Languages available: French, Chinese (Mandarin), Polish, Russian, Italian, Scandinavian languages, Dutch, Greek. Further languages upon request.